The story of a village starts with its name. 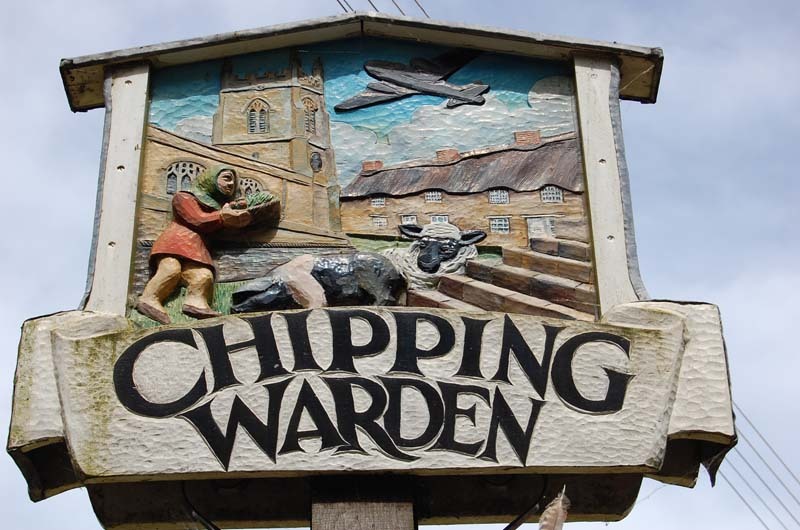 Chipping Warden is the village with a market and a hill from which a watch may be kept. In the Domesday book (1086) Warden is found as Waredon. The word is compounded from ‘weard’ meaning to watch and ‘dun’ a hill. The hill referred to is Warden Hill which lies to the East of the village. ‘Chipping’ comes from the Old English verb ‘ceapan’, meaning to buy, and refers to the market which was possibly first held here in Saxon times. At Chipping Warden Black Grounds, and in a field called the Cauldwells, lived a Roman land proprietor in his villa. The foundations of the villa were discovered about a hundred years ago, also fragments of Samion and Castor pottery used in the house. The house included a bathroom 36ft long and 10ft wide which has been excavated, a feature which would not again figure in the homes of the village for several hundreds of years. Roman coins have been found in the locality dating from A.D. 250-390. William 1, having defeated the English Army under Harold of Hastings, proceeded to deprive the English Lords of their lands bestowing them to Norman Knights. 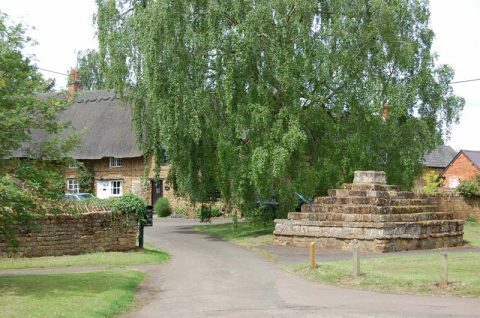 In 1086 at the time of the Domesday Survey the lands in Chipping Warden which had been previously held by a Saxon named Tosti, were in possession of Cuy de Reinbuedcurt, who held them directly from the King. At Edgcote, lands which in former times had been held by a Saxon thane named Burred, were handed over to a lord named Walchelin, who held them from the Bishop of Coutanes in Normandy. A great distinction of Chipping Warden during the Middle Ages was the possession of a market. By the reign of Henry III, the market was highly successful, for in 1227 the King, at the request of Hugh, Bishop of Lincoln, in whose diocese Banbury lay, withdrew the privilege of the market as it was proving an important rival to the Banbury one. In 1238 the ‘Manor’ of the village had passed to Girard de Furnivall who obtained from the king once more the right to hold a market in the village on a Tuesday. The market was still active in 1362 as an action was taken against the Vicar of Blakesley for disturbing the market – the exact nature of which is not disclosed. However there is no more mention on the market in history after that time, not even the date on which it ceased to be held, but the base of the Market Cross may still be seen near the Church. The village like every English village, made its tragic contribution to the success of the Wars with the lives of some of its men. The stones in the Church bear testimony to this loss. In the Second World War the aerodrome was built, which enlivened the village with the sound of aircraft and crew. RAF Chipping Warden opened in 1941 as a Bomber Command Operational Training Unit. On 1 December 1942 a Vickers Wellington bomber crashed on take off, hitting the control tower and hangars, killing two people and causing many other casualties. 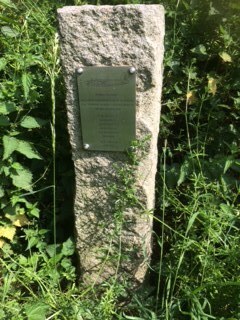 The memorial on the Edgcote House drive (pictured above) commemorates the crew of a Wellington Bomber that crashed there on the 18 April 1945. Source: The Parish History of Chipping Warden and Edgcote. If anyone would like to add / edit / update this short history of the village please contact Natasha Douglas.